In early May, a poll of New Hampshire Democrats was carried out asking primary voters in the bellwether state their preferred candidate for president in 2020. 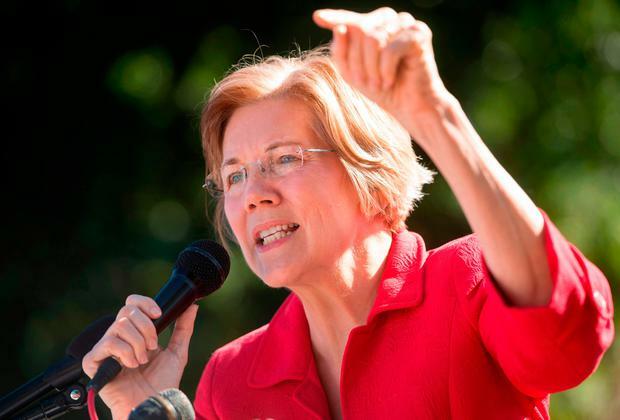 The frontrunner was neither Bernie Sanders nor Joe Biden, two of the favourites, but Elizabeth Warren, the 69-year-old Massachusetts senator who seems to have niggled Donald Trump more than any other politician. Ms Warren was backed by 26pc of respondents, 6pc more than the former vice president. Intriguingly she was backed by twice as many respondents as Mr Sanders, the supposed darling of the Democrat left. She has repeatedly denied that she is running for president, but commentators in the US are treating this with a pinch of salt. After all, Barack Obama swore blind that he had no interest in seeking the 2008 Democrat nomination. Facing re-election in the mid-terms, Ms Warren has insisted that she is only focused on retaining her Senate seat. Interviewed on 'Meet the Press', she evaded answering whether she would serve her full six-year term. Perhaps wisely she is keeping her powder dry for the time being, waiting to see how the race shapes up before deciding whether to make her move. Even though she would be 71 by the time of the next presidential election, she would still be several years younger than Donald Trump as well as Mr Biden and Mr Sanders. "I think she would be an excellent candidate," says Willy Ritch, a former congressional staffer on Capitol Hill. She is a woman, she is a populist. She is a hybrid of the Democrats' two leading candidates last time - Bernie and Hillary. "When I worked on the Hill there used to be a messaging meeting at 8am. I remember when she came to speak to us and everyone was blown away by how clearly she could describe the economic problems in a way that people could understand. "It is hard to think of anybody else who has been so unflinching in taking on Trump and he has just responded with petulant name-calling." Ms Warren's path from a registered Republican and law professor to a late-in-life left-wing politician has neither been easy nor devoid of controversy. Oklahoma-born, she married her high-school boyfriend Jim Warren at the age of 19 and had her first child, Amelia, when she was 22, dropping out of her studies at George Washington University. Two years later she went to law school, graduating just before the birth of her son, Alex. In 1980 she divorced Mr Warren, and six months later married Bruce Mann, a legal historian at the University of Connecticut. Ms Warren moved on to the University of Texas Law School in Austin, where she developed an interest in bankruptcy, researching why ordinary families faced financial collapse. In many cases, she found that people filing for bankruptcy were plunged into catastrophic debt not because of indolence or reckless spending, but because of life-changing events such as illness or being laid off. It was an academic interest which also appears to have driven Ms Warren leftwards. According to voting records, she was a registered Republican until 1996. Her first book, 'As We Forgive Our Debtors', won a major prize - the Silver Gavel Award - from the American Bar Association. But her work was challenged by Philip Shuchman, a Rutgers bankruptcy professor. His complaints of "repeated instances of scientific misconduct'' were dismissed by both the University of Texas and the National Science Foundation. That was not the only glitch in her upwardly mobile academic career. In 1987, she was hired by the University of Pennsylvania Law School and it emerged that she had listed herself as a minority in the Association of American Law Schools Directory. Successive universities have insisted that Ms Warren's assertion that she had some Native American ancestry played no part in her being hired. But it has been a gift for Donald Trump who scathingly dubs Ms Warren "Pocahontas" every time he mentions her - which is fairly often - on Twitter. By the time she ran for office, Ms Warren was already recognised as one of the country's leading bankruptcy experts. Charles Fried, who served as Ronald Reagan's Solicitor General and was a colleague of Ms Warren at Harvard, is an unstinting admirer of her work. "What people need to understand is that she is no socialist, she is not Bernie Sanders. She believes in the capitalist system, but like a good 19th-century liberal she believes capitalists and markets should not only be free, but honest. "She is very open to the ideas of moderate Republicans - like me." Should Bernie Sanders decide against running, then Ms Warren would be the likeliest candidate from the party's populist wing. "She is certainly smart enough, tough enough, disciplined and fearless - all pretty good traits to have as a presidential candidate," said Steve Jarding, a Democrat activist and professor at the Harvard Kennedy School of Government. "Bluntly, my fear for her is that she can come off as a bit too steely and a bit cold. She needs to allow other dimensions of her personality to show through - laugh more, soften the edge she often carries. Independent.ie Newsdesk Another visitor to the Grand Canyon National Park has died after falling 200ft over the edge. A MOTHER who ran over her young son when he refused to go to school, causing serious brain injury, has been sentenced to 30 days in jail. Fellow journalists from across the UK and Ireland held vigils in memory of Lyra McKee as her funeral was under way in Belfast. Dust from the Sahara Desert has settled in the UK after being blown over from north Africa.